Wheat cents are uncommon, though not difficult to find. They have become more rare in recent years and are collectible coins gaining value. The Wheat Cent Penny features Lincoln on the front, with wheat stalks on the edges of the reverse side of the coin. 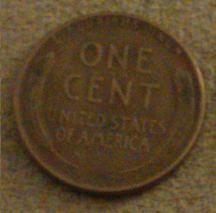 These pennies were produced between 1909 to 1958. Finding an uncirculated coin will mean having to purchase it. But you can find a circulated coin without too much difficulty like in the photos displayed here. The 1943 penny is displayed to note that due to war conditions in World War II having a need for copper for war materials resulted in the penny being made of steel. 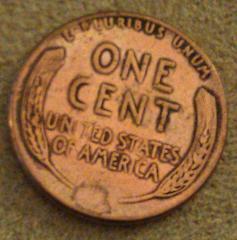 There are some rare copper made pennies in 1943, but almost exclusively they were produced with steel. Feel welcome to read more about the 1943 penny.